Rep. Ilhan Omar is "off her rocker" and her fellow member of Congress, Alexandria Ocasio-Cortez, is a "joke" who will be seen "ultimately as an asterisk" in history, according to former New Jersey Gov. Chris Christie. Rep. Ilhan Omar is 'off her rocker' and her fellow member of Congress, Alexandria Ocasio-Cortez, is a 'joke' who will be seen 'ultimately as an asterisk' in history, according to former New Jersey Gov. Chris Christie. Omar, D-Minn. is facing fierce backlash after a speech at a Muslim rights group's event in which she described the Sept. 11, 2001, terror attacks as "some people did something." Speaking on the Brian Kilmeade Show on Fox News Radio, Christie, who initially thought his wife was in the Twin Towers on the day of the attacks, said: "As somebody who had my wife two blocks away from the World Trade Center that day, my brother on the floor of the New York Stock exchange, and a number of people in our local parish here who passed away, a murder occurred. "Multiple murders occurred, 2,900 murders occurred on that day by radical Islamic terrorists and that’s the way it should always be spoken about to honor those victims and this woman is completely – let’s put aside her religion for the moment - as a public servant, she’s off her rocker to be describing it that way and it’s a disgrace, it’s a disgrace to anyone in her congressional district who voted for her." On fellow freshman Democrat Ocasio-Cortez, D-N.Y., who leapt to Omar's defense, Christie dismissed her as nothing more than a flash in the pan. “This is the problem with people like Alexandria Ocasio-Cortez. They like to talk a lot, but they don’t want to be held responsible for anything they say, and the fact is that to diminish the attacks on 9/11, the greatest attack ever perpetrated on this country, on our soil from a terrorist organization, is to demean the lives that were lost that day, both among those who were in those buildings and on those planes, and those who lost their lives trying to save them. "What she should do is apologize, and be done with it, because there’s no justifying it, and listen, part of it too Brian, is I’m so tired of hearing 'AOC' as she’s called, being given airtime in this country. She’s a joke. "She got elected because a member of Congress [Joe Crowley] went to sleep and never went back to his district and was too busy running for speaker rather than running to keep his congressional seat and I think she will be seen ultimately as an asterisk in history because I can’t imagine she will stay all that long. Omar told a Council on American-Islamic Relations (CAIR) fundraiser earlier this week: “CAIR was founded after 9/11 because they recognized that some people did something, and that all of us were starting to lose access to our civil liberties." CAIR was actually founded in 1994. Her comments have drawn ire from the likes of Rep. Dan Crenshaw, R-Texas, and the New York Post, which published a dramatic front page Thursday with an infamous photo of New York City’s Twin Towers on fire on the day of the attacks. 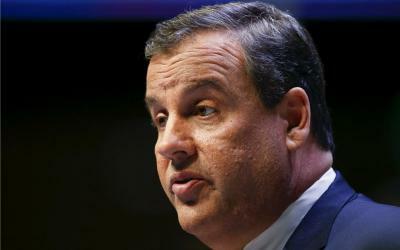 Christie also offered his thoughts about Julian Assange, calling him a "villain"
“In the end, I think Assange is a criminal and I think that’s what’s going to be proven when he’s brought to an American courtroom," he told Brian Kilmeade. And on Bill Barr's testimony earlier this week, and James Comey's subsequent comments attempting to dismiss it, he said: "Jim has completely taken leave of his senses and to try to defend the indefensible, which goes all the way back to his conduct and what he said about Hillary Clinton in the summer of 2016, the letter he wrote in the fall of 2016, Jim is still trying to defend the indefensible.